The UK’s Defence Science and Technology Laboratory (Dstl) has announced a technology licensing opportunity for a low-cost, easy-to-use, man-portable device for isolating and decontaminating a chemical, biological or radiological hazard on a level or near-level surface. The device is adaptable to provide an airtight seal around a sample, located on a range of surfaces, and offers automated decontamination for hazards that can be addressed using UV light and/or carbon filtration. The device is envisaged to be suitable for deployment to an incident to establish safe isolation and decontamination of a sample with minimal user involvement, for example a suspicious found item, postal letter, or small hazardous industrial material container. This device is particularly suitable for use by individuals who are not specialists in handling chemical, biological or radiological hazards. 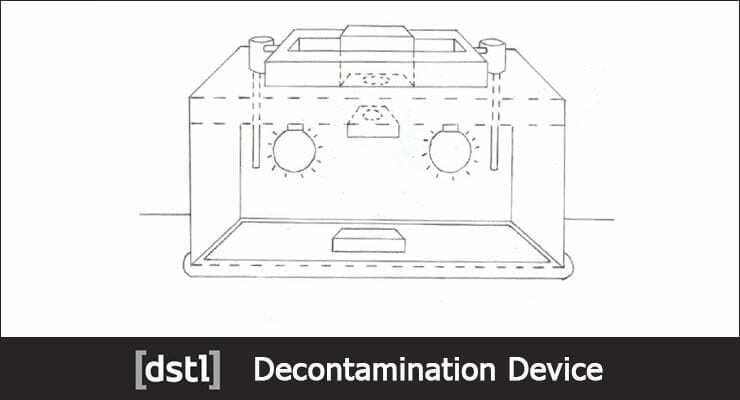 A patent application (1511765.8) has been filed for the decontamination device. For more information, please contact dstleasyip@dstl.gov.uk.